The Palestinian Journalists’ Syndicate (PJS), on Thursday, condemned the Israeli barring of the Associated Press journalist, Nebi Qena, from covering the visit by Britain’s Prince William to the Israeli prime minister’s official residence, on Tuesday. Nebi Qena, the AP’s chief television producer for Israel and the Palestinian territories, was held at the entrance to the residence for 45 minutes, forcing him to miss the event, while other journalists were allowed to enter. PJS denounced, as well, the questioning that was conducted by the Israeli security agents with Qena, about his religion and ethnic background. PJS said it considers this questioning to be racism. Over the years, PJS has noticed what it called disgraceful and indefensible behavior, in several incidents of Israeli security agents ordering international and Arab journalists to undergo strip searches at Netanyahu’s office, in addition to entering through metal detectors. “This Israeli measure against Mr. Qena is added to the 740 Israeli violations against Palestinian journalists and media outlets during 2017; and to the Israeli occupation forces killing the cameraman for Palestinian Ain Media Yasser Murtaja and Ahmad Abu Hussein, who were covering a mass demonstration along the Gaza border with Israel in April 2018,” statement concluded, according to the PNN. 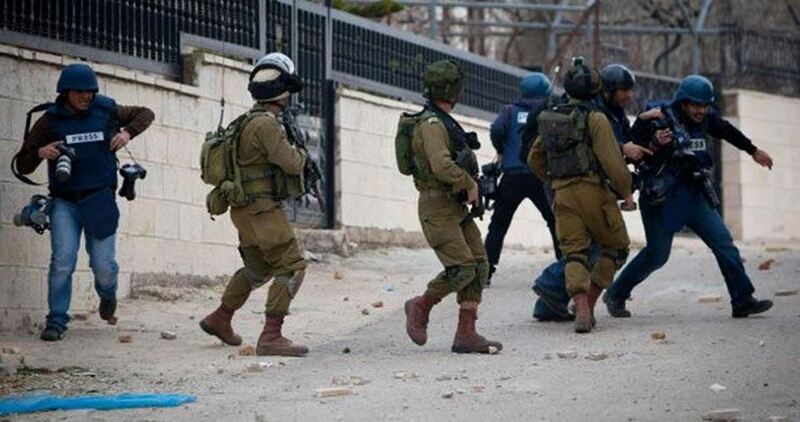 Israeli soldiers abducted, on Saturday afternoon, ten Palestinians, including two journalists, during an activity in support of residents who received illegal annexation orders of their lands, in the al-Hamra area near Bani Neim town, east of the southern West Bank city of Hebron. The activity was organized by the Popular Committee against the Annexation Wall, and Bani Neim Local Council. The Popular Committee said the soldiers invaded the lands, and assaulted the nonviolent protesters, before abducting ten of them, including two journalists. Eight of the abducted Palestinians have been identified as; WAFA News Agency Cameraman Mashoor Wahwah, Palestine TV correspondent Azmi Banat, the head of the Popular Committee in Southern West Bank Younis Arar, Hebron governorate representative Tha’er Hdeib, in addition to Wadea’ Hmeidat, Assad Manasra, Majdi Manasra, and an elderly man, identified as Mohammad Mahmoud Khdour. The Israeli army declared the entire area a “closed military zone,” and forcibly removed the protesters. 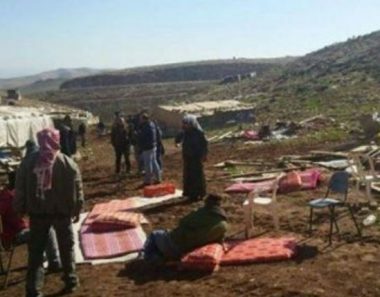 It is worth mentioning that Israel is trying to confiscate 20 dunams, owned by members of D’eis Palestinian family in the al-Hamra area, in order to build a new illegal colony, especially after colonialist settlers installed, last week, a tent, a mobile home and a barn. Israeli soldiers injured, Friday, seven Palestinians, including one journalist, after the army attacked the weekly protests against the Annexation Wall and Colonies in Kufur Qaddoum town, east of the northern West Bank city of Qalqilia. Morad Eshteiwi, the coordinator of the Popular Committee against the Annexation Wall and Colonies, said dozens of soldiers invaded the town, before breaking into homes and occupying their rooftops to use them as firing posts. He added that the soldiers fired a barrage of gas bombs and rubber-coated steel bullets at the protesters, wounding seven who received treatment by Red Crescent medics. 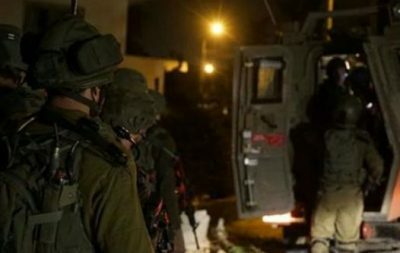 Eshteiwi also stated that the soldiers invaded his home, causing anxiety attacks among hi children, as the army violently stormed the property and tried to occupy its rooftop. It is worth mentioning that the protesters, including Israeli and international peace activists, marched carrying Palestinian flags, and chanted against the ongoing illegal Israeli occupation and aggression. 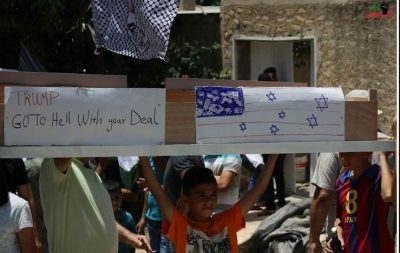 They also carried a mock coffin inscribed with the words “Trump, go to head with your deal” before burning it, and affirming that the Palestinians will overcome all conspiracies against them, against their just cause, and their struggle for full liberation and independence. The Palestinian Authority’s Information Ministry sent a letter to the International Federation of Journalists (IFJ) complaining about the preliminary Israeli Knesset proposal, which passed the first reading, forbidding journalists, and ordinary residents, from filming and documenting Israeli invasions and military activities in occupied Palestine. The Information Ministry sent a letter to Philippe Leruth, the elected head of the IFJ, and members of its executive committee, calling on them to intervene. It said that the new Israeli law is not only racist, but also targets every Palestinian, and every journalist, who documents Israel’s invasions, criminalizes Palestinian journalists, and prevents them from performing their duties, in direct violation of all related International Laws and regulations, especially the Freedom of the Press. The Ministry added that the law also violates UN Security Council Resolution #2222, which provides protection to the journalists, and stated that Israel is giving its soldiers a free hand in assaulting and arresting the journalists just for performing their duties, and targets the residents who have the right to document the invasions. BDS (Boycott, Divestment and Sanctions) activists, in addition to local journalists and social media activists, are documenting the invasions, serious violations. They are documenting crimes committed by the Israeli army with direct support from the political leadership in Tel Aviv. Several political analysts in Palestine, and Palestinian solidarity activists, said that the new Israeli law is yet another proof that Israel fears the truth, especially since its army has been caught on video so many times, committing serious violations and crimes against unarmed Palestinian protesters, and the civilian population. They added that this law, which violates every related international law and agreement, would have been described as a form of dictatorship if it was enacted by other countries. Palestinian Journalists are facing ongoing Israeli aggression, and are paying a high price due to these violations, resulting in the recent deaths of two journalists, Yasser Mortaja and Ahmad Abu Hussein, who were killed by the army in Gaza, this past April. After Israel released the Elor Azaria, the 19-year-old Israeli soldier who executed the seriously wounded Palestinian, Abdul-Fattah Sharif, and was pardoned and released just nine months after committing his crime, in which he was only sentenced to 18 months in prison, and after Israel arrested and interrogated the Palestinian journalist, Imad Abu Shamsiyya, who was also subject to constant violations for documenting this crime, Tel Aviv now wants to criminalize, and imprison the journalists for performing their duties, for exposing the violations. 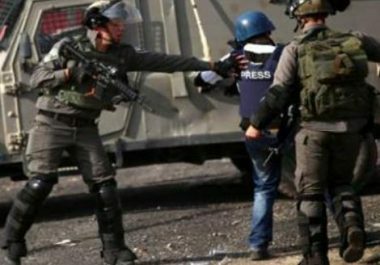 Israeli soldiers also carried out 106 violations against Palestinian journalists this year alone, and four violations against media outlets, in addition to six attacks targeting Palestinians who work for media agencies. The new draft law, which was presented by Member of Knesset Robert Ilatov of “Israel Our Home Party,” with full the backing of Israeli Prime Minister Benjamin Netanyahu, is meant to prevent the media, and the people, from documenting the ongoing Israeli crimes against the Palestinians, and grants the army a green light for more violations. This law also threatens foreign media agencies and journalists, and is meant to terrorize them, to force them to refrain from documenting the army’s violations in occupied Palestine. This law requires all of us to act, all around the world, and requires immediate intervention from the IFJ to protect the sanctity of the media and its freedoms, as stated by all related International Laws and regulations. An Israeli bill banning the filming and photographing of Israeli soldiers' violations in the West Bank passed a preliminary Knesset vote Wednesday. According to the Hebrew media, 45 members of Knesset supported the bill, while 42 stood in opposition. Coalition members clarified that the wording of the bill would change before moving forward. The bill has to pass the second and third reading before becoming legislation. However, anyone who documents such activities and disseminates the information with an intent to harm national security could face up to 10 years in prison.